"We hope that this study will highlight the marine species that are most in need of management and conservation actions under climate change," said William Cheung, associate professor in the Institute for the Oceans and Fisheries and director of science for the Nippon Foundation - UBC Nereus Program. As part of the study, UBC researchers created a database that examines the long-term vulnerability of marine species that are important to fisheries around the world. The database was developed with an approach that uses "fuzzy logic" to combine information about the biological sensitivity of these species to environmental changes as well as their projected exposure to changes in the ocean including temperature and oxygen and acidity levels. "How susceptible are Atlantic cod to climate change compared to skipjack tuna? How about smaller fishes such as anchovy and pilchard?" asked Cheung. "We know that some characteristics of the species make them more sensitive and less resilient to climate change." "Eastern Australian salmon is highly vulnerable because their distribution is limited to shallow coastal and estuarine waters in southern Australia and New Zealand," said Miranda Jones, the study's lead author, who was a postdoctoral fellow in the Institute for the Oceans and Fisheries when the study was underway. "The species lives in habitats that are exposed to large changes in ocean conditions and have limited scope to avoid these changes." 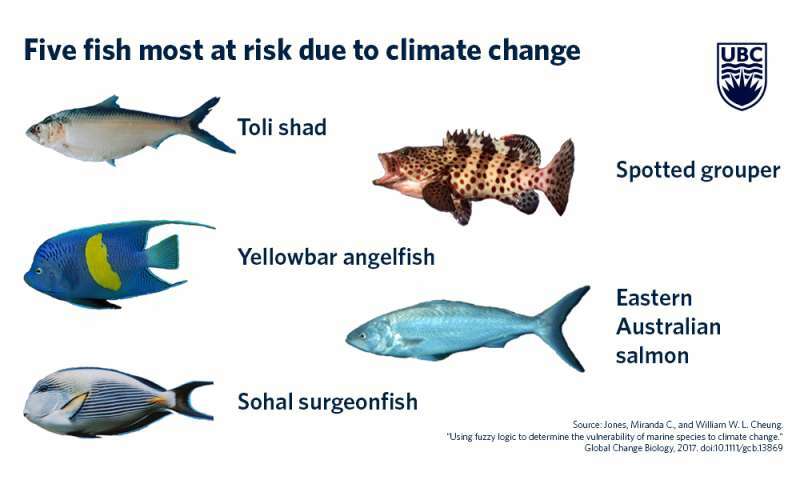 The study "Using fuzzy logic to determine the vulnerability of marine species to climate change" was published today in Global Change Biology.